amazur09 | The greatest WordPress.com site in all the land! For this assignment I wanted to report something interesting and something I would like. I asked around campus of there was some kind of workout group or fitness club and someone told me about the lifting club. I got in contact with the person who organizes this club and he told me he would be more than happy to have me report about their club. They are trying to get more people involved and get their name out there because not a lot of people know about this club. I really enjoyed being able to film something while they are actually doing their work. It was really interesting how into the club these men were. I didn’t enjoy how many videos I had to record. I found myself recoding for a good hour, hour in a half. It surprised me how willing the people were to let me film them work out. I didn’t think it would be so easy to get them to say yes. I was nice to have them so welcoming and willing to tell me about their club. If I were to do something differently I would have interviewed more than two people to get more facts about the club. However, only two people were willing to get on camera and talk about themselves and the club. I see myself using this video in the future because I want to work for sports media so it really helped me get experience on filming live people working out and moving around. I’m sorry the video was late; there was a miscommunication on who was posting the video. I really liked this assignment because it was a hand on assignment and it made me get involved a lot and I really enjoyed filming. For the assignment I attended the women’s basketball game Wednesday, December 4th. I don’t have data on my phone so I couldn’t tweet at the game however, I wrote down all the tweets I wanted to tweet so all I had to do was go home and tweet them. I did a live-post for this event. They played against the Colorado Buffs who are ranked 11th. The event took place at the arena-auditorium, also known as the AA. The cowgirls came into this game with a overall record of 3-2. I really enjoyed this experience because I got to watch a sporting event. I liked being able to tweet about this event as a reporter because I felt like I was important if that makes sense. This was a interesting event and I enjoyed every moment of it. One thing that I didn’t like about the experience was that it was hard to just watch and enjoy the game while writing down the tweets. I couldn’t just relax and enjoy the game. But that’s okay because thinking of tweets was fun. I learned that when reporting a live event you need to know background on the event and people who are in the event. It really surprised me how hard it would be watching the game while tweeting while knowing info about the teams and the girls names. If I could have done something differently in this assignment was study the teams that were playing the day before or even before the game so I knew more about the teams and players. In the future for social media I see myself using it for working with a professional soccer team. That would be awesome! I really enjoyed this assignment! Again, I apologize for having to tweet after the game when I got home. My data on my phone isn’t working. However, I wrote down every tweet I wanted to tweet on a piece of paper. This assignment was very difficult for my partner and I. We had a hard time setting up the slideshow. We split the project in half so Alex was in charge of the slideshow and I was in charge of the audio part. When I was making the audio I had to record a lot of different people because they audio kept messing up. It took a while to actually get the audio down. The biggest problem we had was the adding the picture part to the slides and then downloading the link. We struggled a lot with this and that’s why it took a while to finish the project. But thanks to your help we were able to understand how to do it better. I really liked working with Alex. We were able to work together with no issues. I liked how we split the project up so we each knew what we needed to get done. However, Alex had some problems with his part but we figured it out and it all worked out in the end. If I were to go back and change something about this project I probably would change how we went about the project. If we would have realized what we struggled with earlier then we could have got help a lot earlier. However, it all worked out and I’m happy we finished it. I really hope we don’t get points off for this project. Alex had a hard time getting in contact with you for help and that’s why it was a little late. We wanted to make sure we did it right before we turned the project in. I did like this project but it was very difficult and we struggled a lot. Editing this audio was not as hard as I thought it was going to be. I did get help from some classmates today after class which helped me understand how to cut film and delete noise in the back ground. The thing that was hard was that the speaker said um a lot and it was hard to cut that out but not the stuff I wanted. I learned how to use the different software during this project. I really liked that because I had no idea how to use anything before this project. I learned how to cut audio down by a lot and cut out unnecessary parts. I really enjoyed using Audacity. I’ve never heard of that software till this class and I really like it. I didn’t enjoy having to delete the noise in the background. That was really tough but I figured it out. The thing that really surprised me was how I could cut the audio down by three minutes. Before doing this project I thought that part was going to be really tough but after actually doing it, it wasn’t as hard as I thought it was going to be. If I were to go back and redo it, I would for sure do it in a much quieter place. Cutting the background noise out was really tough and took a lot of time to do. It would have been a lot easier and would have gone a lot smoother if I were to just record my partner in a much quieter place. I really enjoyed this project. It’s by far one of my favorite projects I’ve done in school within the past four years. I’m excited for the next blog, it looks like it’s going to be very interesting. This blog was really weird for me. I’m still not sure how I feel about being recorded by someone and then listening to the recording. It made me very awkward. On the other hand, I liked recording my partner. I was fun and exciting. I felt important. I actually learned a lot from this experience. I learned that when recording someone it takes lots of takes to get it right. We recorded each other at least over 10 times each. We just kept messing up and then getting really awkward about it. Overall, I enjoyed the project although I felt awkward when it was my turn to get recorded. Even though I didn’t like getting recorded I still enjoyed the experience. I really liked hearing what my partner had to say and I was really amazed with his stories. I didn’t enjoy listening to myself on a recorder. It was so weird to me and made me feel awkward. If I had to go back and redo it I would for sure use a different recorder. Using the iPhone recorder was a little rough. I didn’t go so smooth however, it worked out and we figured out how to use it the best way. 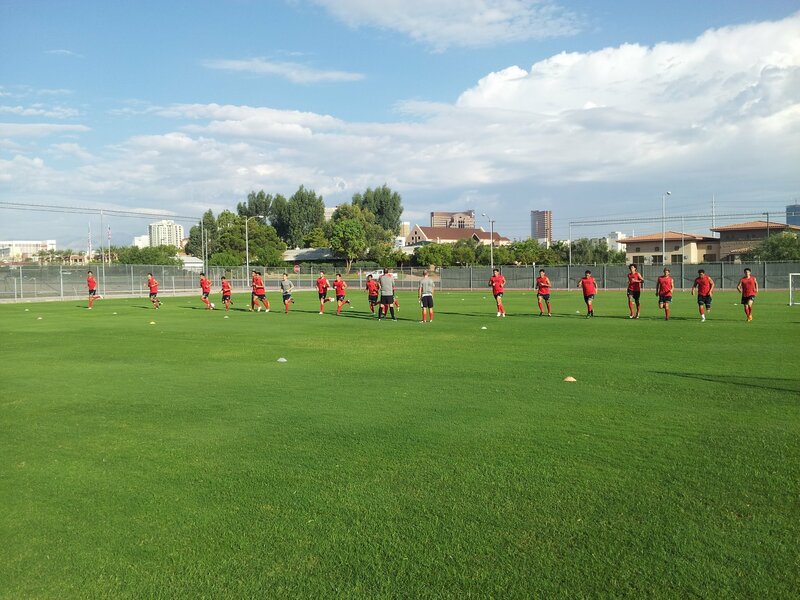 Joaquin Rivas, a Junior at UNLV, joins the UNLV men’s soccer team in a jog and stretch on their home field. This practice took place Saturday morning at 9 AM. I attended this practice because I was visiting UNLV this past weekend. This event took place during a beautiful day. It was about 85 degrees out in Las Vegas that morning. I sat on the sidelines watching practice for two hours. It was pretty easy to get this shot because I was able to get up close and take different shots from different angles. I felt like I was a part of the event while taking lots of pictures during the men’s practice. This photo was easy to capture because I was able to take photos of the team from different angles and at different times during their practice and didn’t have any trouble. Viewpoint was the key creative device for this picture. 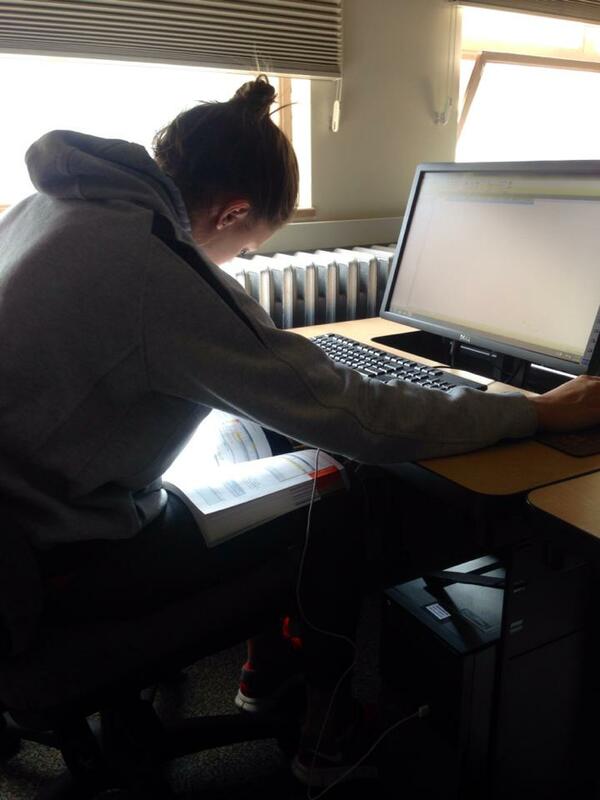 This photo is of a University of Wyoming student, Kristin Howard, studying at the library on campus on a Monday afternoon. I was walking through the library to rent a book out when I noticed this junior sitting focused at a computer in the corner. I took this photo of Kristin because I saw how focused she was and it inspired me. It wasn’t too difficult to take this photo because there was a lot of open room where I could take many pictures at different angles to find the best photo of her. I asked her for permission after I captured the photo. Having a creative device for this photo was hard however, I found that the viewpoint was the best device to use. This photo was taken while Kirsten Phillips was feeding her horse at her ranch in Laramie Wyoming.I really like horses so I went and checked out a couple ranches in Laramie a stumbled upon this one. I asked for permission to watch Kirsten Phillips train her horse. 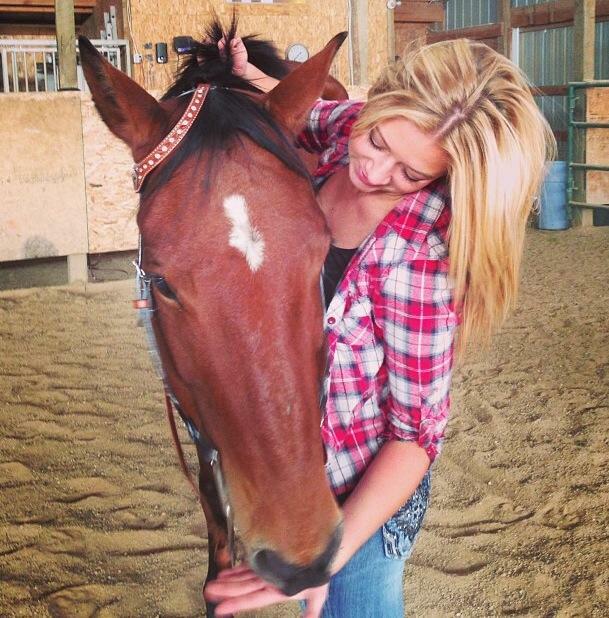 This photo was taken while she was feeding her horse after ridding it Monday morning at 9:30 AM. IT was a beautiful morning for a nice ride, not too cold. It was a little difficult to capture this shot because I had to get the right angle where she couldn’t see that I was taking a picture. I really liked this shot because it showed a lot of emotions from the horse and from Kirsten. For the creative device in this picture I used focus. This is because I needed an up close picture. 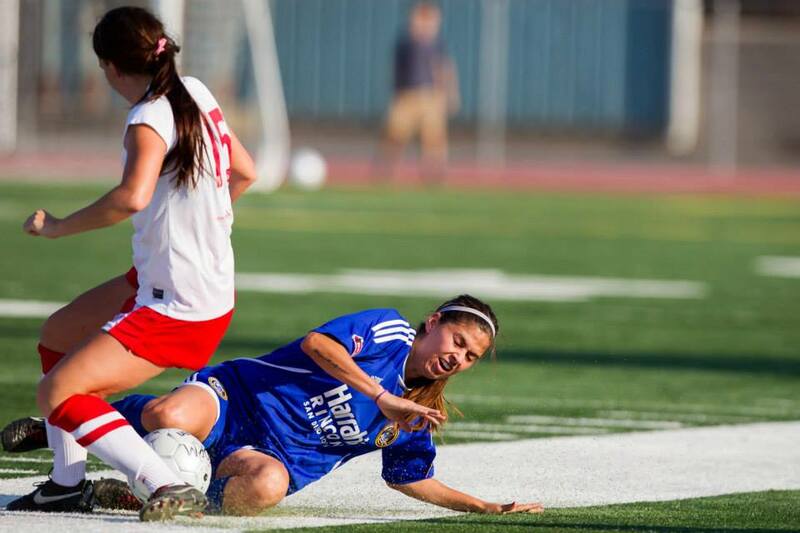 Kaylee Vitale, a senior at Bishop Gorman, gets tackled by her opponent during her high school game. Bishop Gorman won their game that took place at Bishop Gorman in Las Vegas Friday afternoon. The weather was so perfect for a soccer game. It wasn’t too hot or too cold and there was no wind blowing. I attended this game to watch my friends sister play. This photo was really hard to take because it was an action shot. I took a billion pictures and happened to capture a good one. There is so much emotion in this picture, I feel like I’m part of the play. I asked Kaylee after the game if I could use this photo for my project and I was happy she said yes because it was such a great action shot of her and her opponent.I zoomed in so the picture would look up close. Cropping was a key creative device I used for this photo because I only wanted the play that was happening at the moment in the picture. Morgan Seeley Riding the bull at the Cowboy Wednesday evening. 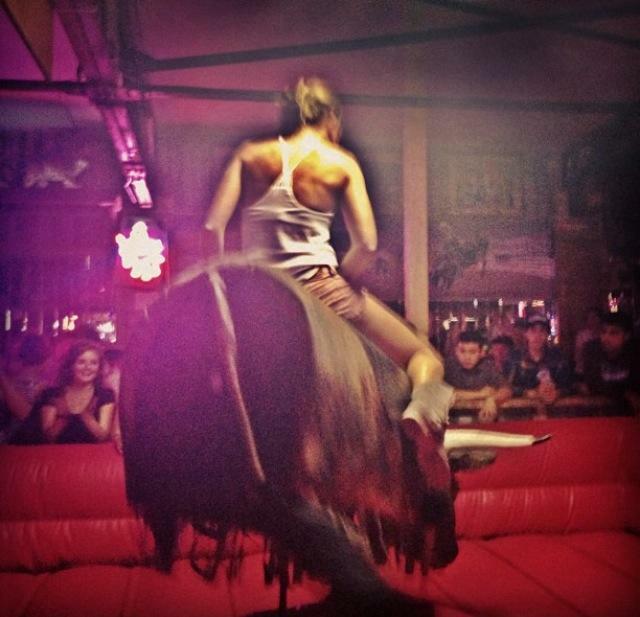 This was Morgan’s first time riding a bull. I overheard her talking to her friends how it was her first time and how she really wanted to do it. I took many picture while she was on the bull and afterwards asked for her permission to use the photos. It was kind of difficult to take this photo because of how many people were around. I didn’t have a lot of space to work in however, I’m very happy with how the picture turned out. There’s a lot of emotion in this picture even though you can’t see Morgan’s face. I like how you can see the light shinning down on her, it shows a lot of emotions. Looking at this picture makes me feel like it was an intention moment for the bull rider. Focus came into place when i used a creative device in this picture. I was very happy with this assignment. I feel like I learned a lot from the last assignment and I tried to use your feedback to help me with this assignment. Editing the photo surprised me. I didn’t realize how difficult it would be. If I were to change something about this assignment I would have worked on the coloring more. I feel like I did a good job with the pictures I used. This picture is of a unique toaster in the Grove. 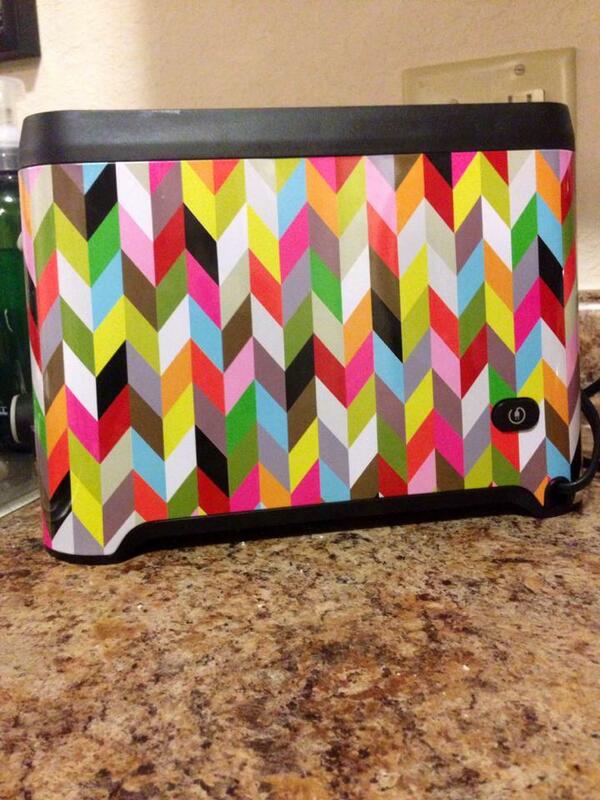 You can see the different colors in the different patterns around this toaster. the dominant creative device is symmetry and patterns. The dominant creatuve device draw attention to the photo’s focal point and captures the viewer’s attention because of the colorful patterns. The parterns are in such a unique way it draws attention to the picture. Because of the dominant creative device being symmetry and paterns it creats an aesthetically-pleasing photo. This is also because of the way the picture is taken so close to the patterns you can really see the different colors and they way the pattern lays out. In this photo i feel that there is another creative device which is cropping. While taking this photo, I cropped it so you could see the paterns up close and get a feel of the different colors in the patterns. by cropping this photo it creates an aesthetically-pleasing photo. 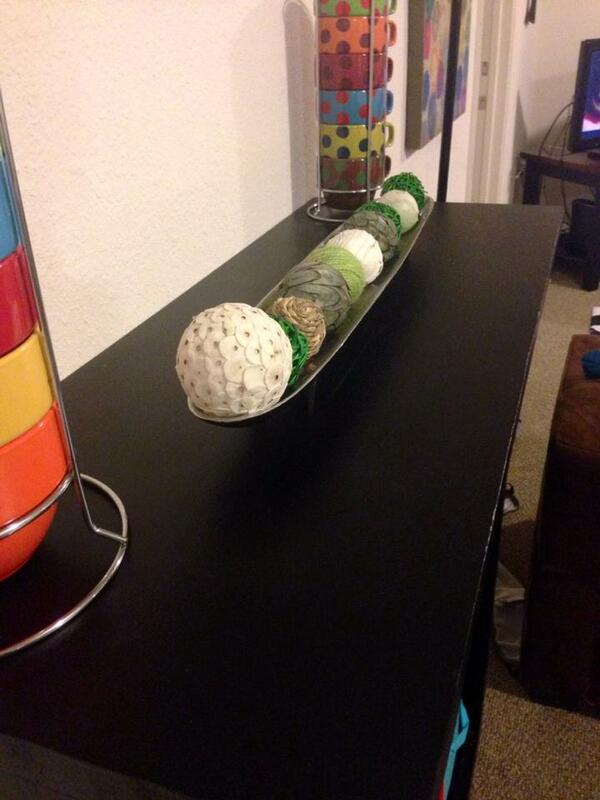 This is a picture of decorative table balls, which are straw balls. Each ball is a different color. Theses balls are in a staright line sitting on a metal holder. The creative device used in this picture is leading lines. Because the dominant creative device is leading lines it draws the viewer’s attention by the way the picture is set up. Because the object is in a line and going outwards it catches the veiwer’s attention easily. This dominant creative device creats an aesthetically- pleasing photo because of the different size balls and the different colors of them. You can see that the balls are in a leading line and that makes the picture more pleasing. This picture is of three gorgeous piece of art. 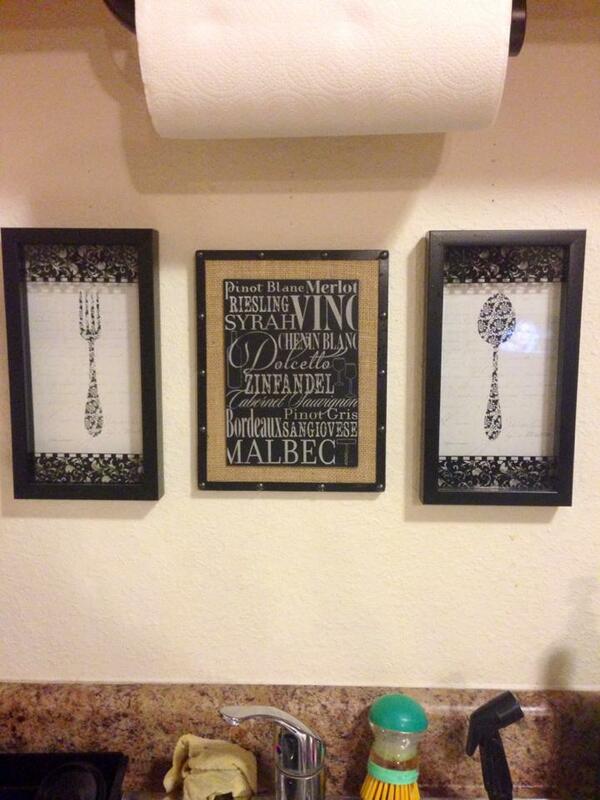 The two that are on the ouside are pictures of a spoon and of a fork. The one that is being bordered by the other two is a famous quote. In this picture the creative device that is being used is framing. This creative device is so obvious in this picture because of the way the two outside pictures are framing the picture of the quote. This dominant creative device draws the attention of the viewer’s because of how well the fork and spoon pictures are framing the quote. It brings the attention more on the famous quote and makes the viewer’s want to read the quote. This device creats an aesthetically- pleasing photo because of the on picture that ie being framed. If the picture that was being framed wasn’t a unique and interesting picture then the photo wouldn’t be as pleaseing. This picture was taken of a random guy who was in the middle of texting. I cropped the photo to really get the feel of the texter. I did this by zooming in on the camera. You can see the light from the phone shinning on his shirt. You can tell he’s texting by the way hes holding his phone. 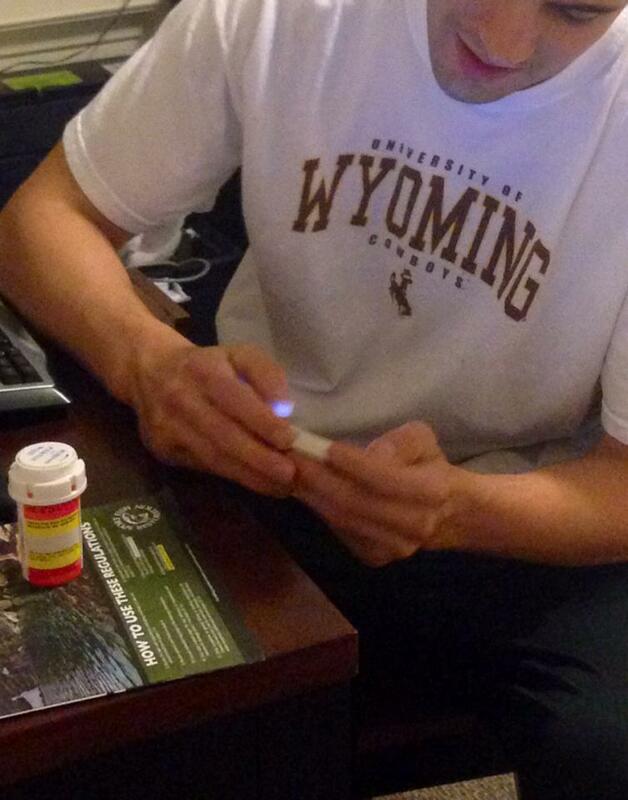 In this photo the dominant creative device being used is cropping. The way the picture is cropped grabs the veiwer’s attention because you can actually see the light coming from the phone and it makes you wonder what hes doing. You can see the way he’s holding the cellular device. This dominant creative device creats an aesthetically- pleasing photo because of the way the camera was angled and the way you can see the screen of the phone shinning on his shirt. That what makes this picture the most interesting. If the photo wasn’t cropped then the photo wouldn’t be as pleasing. In this picture you can see the bright colors so clear. 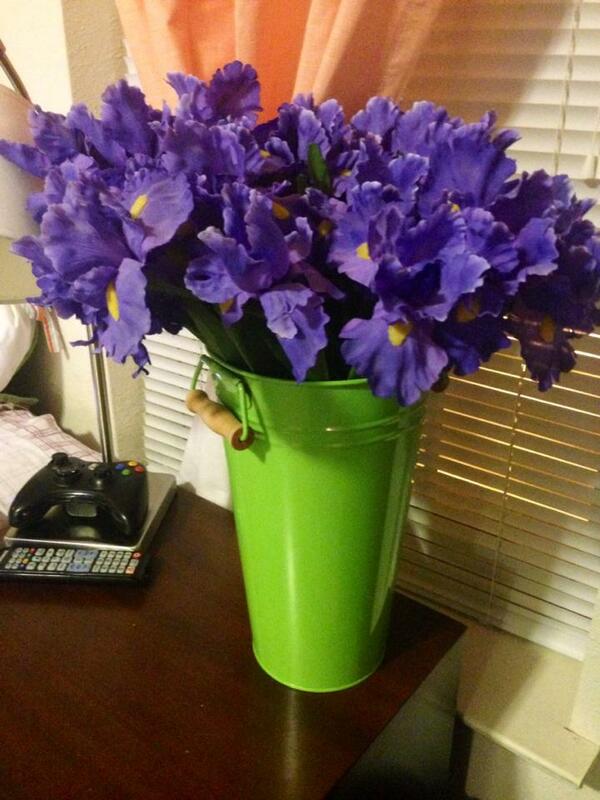 This picture is of fake purple flowers sitting in a lime green flower pot. The creative device that is being used in his photo is color. Because the device is color is easily draws the attention of the veiwer’s because of the bright colors in the photo. The picture is taken at an angle where you can see the colors more clear and makes the flowers look bigger than they actually are. This dominant creative device creats an aethetically-pleasing photo because of the way the colors are standing out. It makes the photo so pleasing to look at. I feel this was the best angle to take this picture so the veiwer’s could really see the contrast of the flowers and the green pot. Doing this assignment I found a lot of things I didn’t know. It’s a lot harder then I thought to take a picture and make sure it’s perfect. Meaning nothing in the background, making sure the lighting it right, ect. If I would have done something differently I would have used a different camera to take these photos. I feel like the photos would have turned out a lot better then they did. But this was my first time doing a photo assignment and I’m so excited to continue and learn more!